Discussion in 'Art & Design' started by candyperfumegirl, Sep 1, 2009. So my roommates and I just moved into a huge loft and have a livin room with 20ft high ceilings. I'm looking around for some ideas as to what we can paint on our walls. It doesn't have to pertain to fashion and doesn't necessarily have to be a "mural". We are just kicking around ideas, so any input would be great. 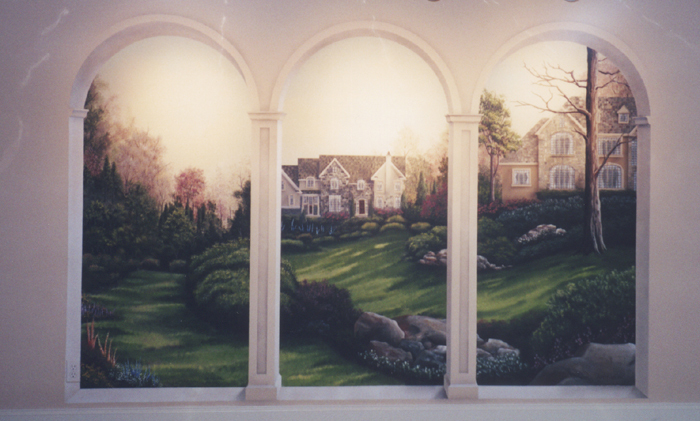 You should totally do a trompe l'oeil. I have to say that most murals are not my taste at all. You could try to fill wall space with a series of picture frames and mirrors. I've always dreamt of having a big white empty room, where I can play around with paint (splahing, using bodyparts as stamps, etc.). So I think a "selfmade Jackson Pollock" would be very nice and something you would have a lot of fun with in the making. And IMO it's timeless and would suit nearly all styles of furniture and decoration. Words and quotes are a really cool idea! But I prefer them on mirrors actually. A friend of mine had the definition of reality (exactly like it's written in the dictionary, phonetic details and everything) printed on a huge mirror and it looked amazing. a bright colour, or vivid painting/picture.. you'll get sick of it after a while i think better to go with something you love but that can blend in to background... something not so domineering that can complement your furniture and your selves while you are in the room... i find intense things give me a headache and aggravate my mood. Words and Quotes is good, totally ! i like the idea of loooads of frames in all different sizes and colours as opposed to a mural! Much as I love him, I don't think I could live with a Mark Rothko homage on my wall. The idea that colour can best express the horrors of the human condition because we've reached a point where figurative painting cannot perform the task is not something I'd want to contemplate every day when I'm having my tea, and I'd probably end up reaching the same conclusion about life that he did, in the end. So it's another vote for the self-made Jackson Pollock. I like silhouettes on the wall ... not that I have any I love Georgia O'Keeffe and have several of her prints framed, including posters from shows of her work I've been to. Some of them are bright, but I don't get tired of them. And everyone can join in - it can be a work of art made by everyone who lives there, all adding their own colours. It doesn't matter if they can't draw, as long as they can artfully splatter some paint in the right direction! thanks for all the replies so far. it's kind of difficult getting everything moving because my two roommates aren't as motivated to decorate. the easiest idea for me to bring to life is definitely the "self-made jackson pollock." the semester is starting to pick up but as soon as i have some time to paint i'll be sure to post the results. i really like the self made pollock idea too..
i collected quite a few images to inspire me with this sort of thing because we did a mural recently, but they're on another laptop unfortunately!. i'll try to find them again online and gradually post in this thread as i do..
here is what we ended up doing.. only now there is one addition.. a definition, which says.. LIMINALITY: a psychological, neurological, or metaphysical subjective, conscious state of being on the threshold of or between two different existential planes, where normal limits to thought, self-understanding, and behavior are relaxed - a situation which can lead to new perspectives. this was largely why i wanted to do a mural.. i love these so much. the rooms are designed by philippe starck, i don't know who did the drawings on the walls though, whether that's part of his work or not. it is a restaurant / bar etc in madrid..
originally i wanted to create a base with chalkboard paint and do a chalk mural.. here are a few pics of murals done with chalk.. i think it's a cool idea because it's really easy to wipe off and start fresh..